In Part 1 of this series, I mentioned that in Comets, written 30 years ago, I made fun of propositions from the astrophysicists Fred Hoyle and Chandra Wickramasinghe about viable entities living in comets and being delivered ready-made to the Earth, scattered from the comets’ tails. What follows fulfils a promise to look at Chandra’s present ideas — I hope with an open mind. To back-track a little, there’s a 100-year history of eminent scientists, driven by despair about explaining the very improbable chemistry of life by home cooking on the Earth, suggesting that life came from elsewhere. Of course, their scenarios didn’t explain the origin of life, they merely transferred it somewhere else. Out of sight, out of mind, perhaps. 1907 Svante Arrhenius (yes, the CO2 warming pioneer) suggested that bacterial spores escaped from an alien planet, were driven through interstellar space by the pressure of sunlight, and revived when they reached the Earth. 1971 Francis Crick (yes, of DNA fame) with Leslie Orgel proposed that intelligent beings in another part of the Galaxy spotted the Earth as a suitably wet planet and sent bacteria in a spaceship to seed it. 1979 Fred Hoyle (yes, celebrated for the origin of the elements) with Chandra Wickramasinghe said that life on Earth began in comets, and diseases still come from them. It was hard not to chuckle over their book Diseases from Space, because Hoyle and Wickramasinghe’s account filled the sky with germs, in a distant echo of the old superstition that comets portended plagues. John Gadbury (1665) linked comets and catastrophes -- "Famine, Plague & Warrs" In actuality, bubonic plague afflicted London following the depicted 1664-5 comet. 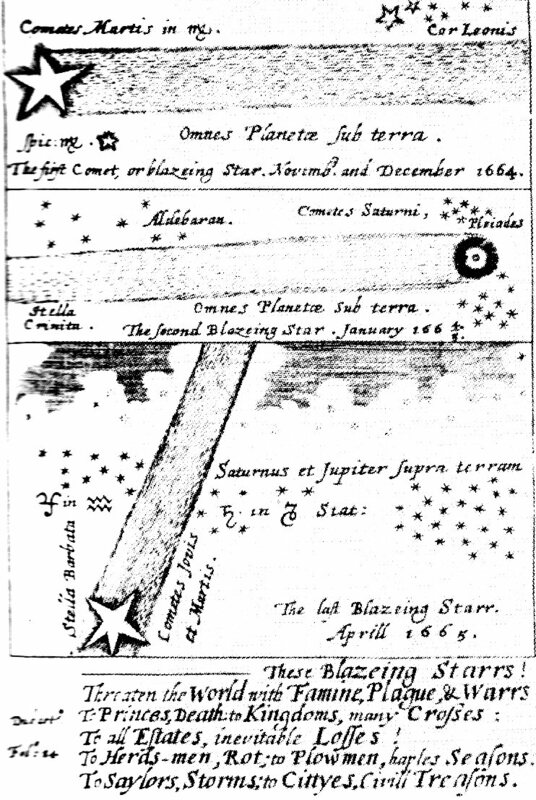 Obtained from the Royal Astronomical Society, this is an illustration in N. Calder, Comets: Speculation and Discovery.